Despite being sentenced to a halfway house for 30 days, Gilbert Arenas has supposedly been losing $250,000 per game based on the dollar amount of his contract. 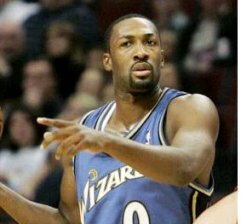 Suspended Washington Wizards star Gilbert Arenas was sentenced Friday to spend 30 days in a halfway house in the wake of his conviction on gun charges resulting from a locker-room confrontation with a teammate. Arenas, who played high school ball at Grant High in the San Fernando Valley, was also sentenced to 400 hours of community service, which cannot be conducted at basketball clinics, and a $5,000 fine.